When talking about safety in relation to hunting, the first place we obviously have to start is with our firearms. We have a detailed article on firearm safety and I would advise reading that article as the first step in making sure you’re safe while out in the field. The biggest take away from that article is to always assume any firearm you come in contact with is loaded; if you remember that, you greatly limit your chances of being accidentally injured when handling a gun. Never take for granted the fact that you are carrying a loaded weapon. Most firearm accidents occur because people don’t respect the fact that they’re holding a weapon that is meant to kill. It’s your duty as a responsible hunter to always follow safe firearm practices; if these safety practices aren’t second nature, I advise staying home until they are. Judgment Mistakes: The number one cause of hunting accidents is mistakes in judgment, such as mistaking a person for game, not checking what’s in front of or beyond your target, and getting caught up in the excitement of the hunt which can cause you to make foolish mistakes. Not Following Firearm Safety Rules: Another common cause of hunting related accidents is not following safe firearm practices like the four primary rules of firearm safety. 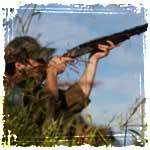 Not Enough Practice: A huge problem that I see out in the field is hunters who don’t know their firearms capabilities. This stems from a lack of practice that can lead to things like accidental discharges and stray shots. Mechanical Failures: When it comes to firearms you can never let your guard down; mechanical failures can and will happen, so you must know how to deal with them when they do. Safe Zone-of-Fire: One of the most important aspects of safely firing your gun while out on a hunt is to never fire your gun outside of your Zone-of-Fire. Your Zone-of-Fire is the 45 degree area directly in front of each hunter. The reason we stay inside that 45 degree area, is that anything outside that area cannot be seen with reliability, and should be considered outside your field of view. Also, keep in mind your Zone-of-Fire will change with every step that you take, so make sure you’re always aware of your hunting partners locations at all times. 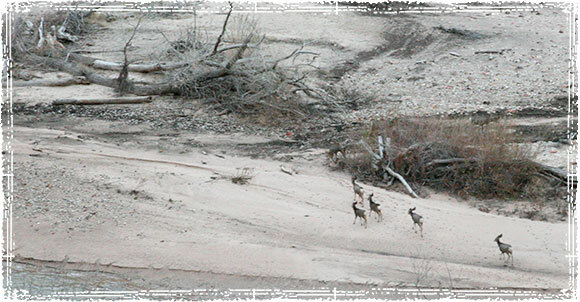 Self-Control: Another important aspect of hunter safety is self-control. It’s not uncommon for hunters to become excited while out on a hunt; just remember that this excitement can cause you to make careless mistakes, so you need to do your best to control your emotions while out on the hunt. If you find yourself becoming anxious, or overly excited, it’s time to slow down. If that means temporarily putting a stop to the hunt, then you need to err on the side of caution. No hunt is worth taking unnecessary risks; the safety of everyone who may be out in the field is always the number one consideration. A calm shooter is always a better and more accurate shooter. Practice & Accuracy: Shooting accurately is not only the key to being a successful hunter; it’s also one of the most important aspects to being a safe hunter. If you cannot routinely hit your targets while out at the range, you have no business hunting anything. You are putting yourself and everyone in the field at risk. Target Identification: If you’re not 100% sure of what you are shooting at, DO NOT TAKE THE SHOT. Anything you shoot at needs to be identified, and needs to be 100% in your field of view before ever taking a shot. The way you carry your firearm in the field is extremely important to the safety of everyone in your hunting group, as well as anyone who may be in your range of fire. By following the number one rule of firearm safety – always keeping your muzzle pointed in a safe direction – you ensure the safety of those around you, and you limit the possibility of someone being injured during an accidental discharge. I’ve seen a number of websites advice people to always point there barrel at the ground when walking; in my opinion, this isn’t always the safest way to carry a firearm. If you’re traveling in a group where another hunter is walking directly in front of you, do you really want to be pointing your weapon at the ground in front of you? There are a number of proper ways to carry your firearm in the field, each with their own fancy name and proper technique; I’m not going to go over them in this article. There are just way too many variables to be able to tell you that one technique should always be used in a specific situation. What I will tell you is something that I have mentioned at least a couple of times already in this article; whatever technique you choose, make sure your muzzle is always pointed in a safe direction, and make sure your finger is always outside the trigger guard unless you’re about to shoot. If you remember both of those tips, and make them something that becomes second nature, you greatly cut down on the chances of having a hunting accident out in the field. Stay Safe, Stay in Control, and always follow the rules of firearm safety. 1 There is no such thing as an Unloaded Weapon! 2 Keep your finger OFF the trigger! 3 Always keep your muzzle pointed in a safe direction! 4 Make sure you know what is in front of and beyond the target! Thanks a lot Rob, very comprehensive. Would it be possible for you to share some tips regarding safety while climbing up and down your tree stand? Would really appreciate it as there isn’t much information on the subject I was able to find. There is some for archers, as in be careful the limbs/string don’t hit the ground and such, but I’d I would like to see something pertaining to firearms specifically. 1. Never carry equipment or a firearm with you while climbing. Use a haul line to raise or lower your gear and firearms. 2. Unload the firearm, keep the action open, and make sure the muzzle is pointed in a safe direction while using a haul line to retrieve your firearm. 3. Make sure the safety is always on. Nice comprehensive list. Too often we forget, get complacent or just aren’t aware of safety. Always keep your muzzle pointed in a safe Direction and Make Sure You Know What’s in Front of & Beyond the Target top my list. Self control is a big lesson that even veteran shooters need to remind themselves of. After 20 years I still have to calm myself before a shot. Great tips. 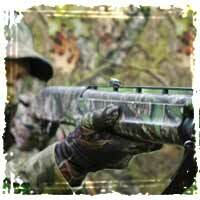 I agree this is a great site to sow how to hunt safe. It shows tips about knowing were you shoot. This is a great article covering hunting basics, and they can actually be applied to all types of hunting, whether its bow hunting, rifle hunting, air rifle hunting. Excellent points. I particularly like your suggestion that there is no such thing as an unloaded weapon – what a simple yet powerful concept that I’m sure will help to improve gun safety considerably. It is nice to review the hunting rules before the season. When you read about hunting accidents it is easy to dismiss it as careless. The truth however, is that we all do stupid things we just get lucky. thanks for the reminder. I agree that the self-control is crucial when it comes to hunting. My brother loves to go hunting and always gets super excited but has to keep in mind that accidents can happen when you don’t stay in control. I will be passing these hunting tips with my brother. My little nephew really wants to go hunting with my father and his dad. So, it is good to know that he needs to get in enough practice before he takes his gun safety test. It is good to know that can be a reason he fails the gun safety course.